These WWII pictures are from the personal scrapbooks of Lt. Colonel O. Howard ("Dave") Davidsmeyer, officer in charge of communications on General MacArthur's staff. Additional documents are from the collection of his son, O. Howard Davidsmeyer, Jr., who as an Ensign in the US Navy was a carrier pilot who flew Tomcats and Hellcats. These World War II pictures are from the SWPA (Southwest Pacific Area). These pages provide WW2 airplane and military pictures along with information about the Army Signal Corps and Navy aviators. 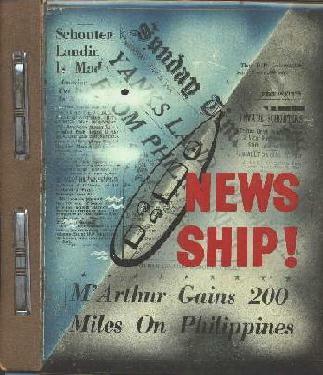 Signal Corps Communications Brochures about the Signal Corps communication ships in the Pacific - cutting-edge of WWII communications technology allowed breaking war news to get to the home front within hours. 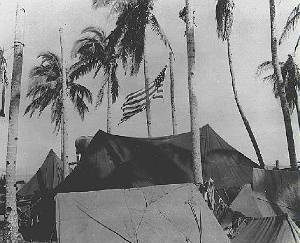 Army Signal Corps Radio Pictures - pictures documenting the Battle of Rabaul in the Pacific were transmitted by radio back to the home front  an engineering first! WWII Machine Guns and Artillery - Signal Corps photographs of US marines and soldiers with field artillery and machine guns, taken on various islands in the Southwest Pacific. Paratroopers - WWII pictures of an island assault by paratroopers. Beach Landings - pictures of beach landings in the Pacific. Army Ships - photos of ships used by the army in WWII communications. Signal Corp Communications Equipment - photos of telecommunications equipment used in the Southwest Pacific Area (SWPA) during WWII. Eleanor Roosevelt - pictures of her visit to the Pacific during World War II. Flat-Hatting WWII US Navy Aviator Training brochure. 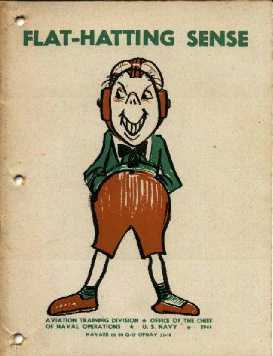 This brochure with humorous graphics discourages young aviators from the deadly practice of "flat-hatting"  flying low needlessly, grandstanding, or showing off, in other words, flying foolishly and carelessly. The term itself is said to have arisen from an incident in which the wheel of a low-flying plane struck a pedestrian on the head and crushed a new top hat he was wearing. O Howard Davidsmeyer - about the man who created the scrapbooks from which most of the pictures on this website came. Many more photos in the scrapbooks ... I've just scanned one of the three photo albums of "Dave" Davidsmeyer. Will be adding more pictures to the web site as time progresses.